Most people have enjoyed making them at some point in their life – and their friends and family members were honored to receive them (and are still honored I hope). Friendship Bracelets are a great way to show to somebody that you’re thinking of your friends and caring for them. If the bracelet is worn until it falls off is a different matter and waiting for the falling off of a bracelet knotted out of Paper Twine requires a lot of patience! Thanks to its smoothness and rigidity Paper Twine gives a modern twist to any bracelet made of it. The bracelets do not only look classy but they’re alse very lightweight and therefore comfortable to wear. 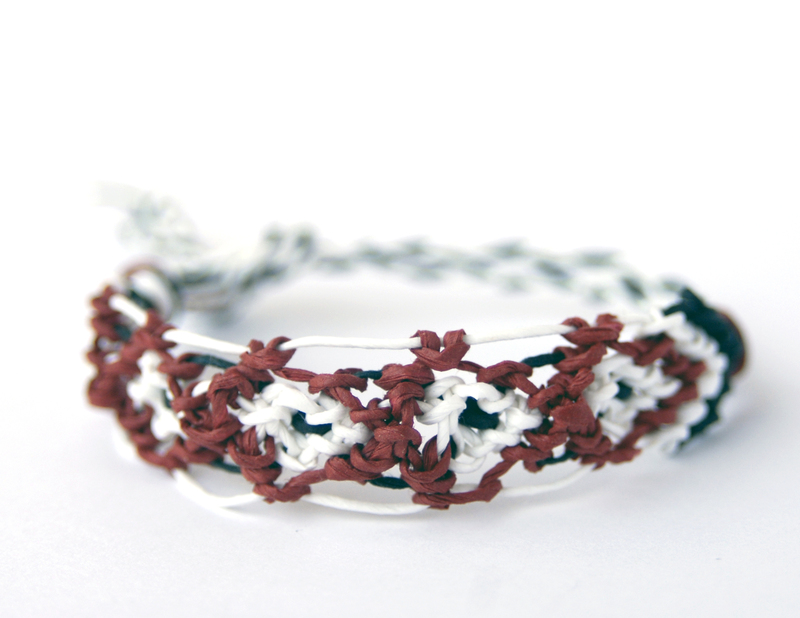 Pictures here is a bracelet knotted of Stong Paper Twine in the classical color combination of white, black and red. A treat for any wrist or if made slightly shorter also doubling up as a beautiful keyring pendant. Your friends will be delighted!